Very proud Dad Alan & Happy son James! 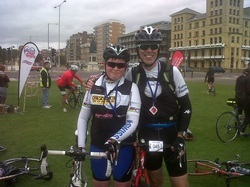 4 members took part in the Brighton to Brighton Sportive yesterday. The route is a hilly one including Ditchling Beacon. James & Alan Bennett cycled the 52 mile route and gained a Silver time (sportive's are graded for age group to obtain either Gold, Silver or Bronze). An excellent result for James's 1st attempt.